I AM FUEL, YOU ARE FRIENDS: Jeff Buckley sings over the phone: Dylan's "I Shall Be Released"
Jeff Buckley sings over the phone: Dylan's "I Shall Be Released"
An author has contacted me to contribute to a book he is writing which indirectly is related to Jeff Buckley, and I am working on giving some initial answers to questions for him about my "relationship" with Jeff Buckley and his music, my perspectives and feelings. Did you ever see him play live, or meet him/speak to him? If not, do you wish you had? (The answer is no, but more than anything I'd love to answer the first part of that question in the affirmative). I've been listening to Jeff Buckley a lot today, and am especially excited about this amazing version of Dylan's "I Shall Be Released" that Buckley performed over the phone for some guys from WMFU Radio some years ago. Jeff's bluesy take on this song from Sin-é has long been a favorite of mine, but there's something about the impromptu scratchy gorgeousness of this version. It's absolutely arresting; I don't know how something over the phone could induce chills, but it does. When I read Dream Brother, one common thread throughout Jeff's life was that he loved to share little bits of himself through his music in random ways with friends and those whom he felt could appreciate it -- so his music crops up in all kinds of unexpected forms. The singing starts at about 4:15. Have you ever listened to Jeff Buckley's dad, Tim Buckley? He has a song called "Once I Was" and its truly one of the most heartwrenchingly, gorgeous songs ever performed. And thanks funk franco for the song! Richard Manuel's version of "I Shall Be Released" on the Band's Music from Big Pink" record is absolutely the definitive version, including Dylan's. His plaintive voice is simply superb on the song. Hi, Heather, I think now it is over a year since I have been enjoying your music blog. After awhile I realized how frequently my HypeMachine trolling brought me to I Am Fuel. Part of my Christmas time will be spent in the Ray Lamontagne country (Northern-Western Maine). I don't think my brother taught Ray's kids, but he could have. This is a remarkable version of one of my favourite songs. Have to say the closing words of 'There's a Mr Zimmerman on line two...' made me smile. 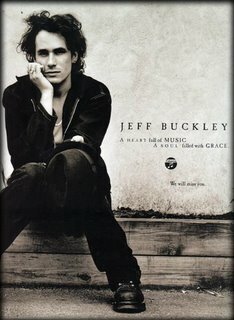 I was lucky enough to see Jeff Buckley in London at an intimate venue called the Garage in Islington at around the time that Grace was released and it was a sweet and giddy gig indeed. I so enjoy this blog, thanks. very funny. especially part : "mr. Buckley, are you on the meeting?". did someone got it, who's that woman. anyway, this is one precios recording. thank you, heather! I was lucky enough to have seen Jeff in concert in Tempe, Arizona at a small movie house theatre. Around 40 people showed up. My friend, Karen and I were late because catching a beer buzz before the show was priority in my life at that point. We missed a third of his set. I kept telling myself: "Where is everybody, this man's great?" and "Damn, why was I late?" My friend Karen, kept assuring me that he'd be back. Sadly that turned out to not be the case. If I may , can I put a shout out to all Jeff Buckley fans on the net. Does anyone have a recording of a radio session Jeff did at KASC (ASU college Radio Station) that same day, of the Tempe show? anyone? this is amazing, wow, thanks. gentle soul with a fiery heart. i have an immense mp3 collection and thousands of cds. ive heard so many things - and i honestly think that this is one of my favorites. oohhh dear.. I'm really thankful for that!! I was eager to hear this sort of stuff also after I read Dream Brother.. I love that he used to leave songs in Rebecca's answer machine.. really sweet! this is beautiful.. (love the fact that over the phone he sounds like he has a cold.. and the backing vocals are sweetaaa) thank you so much Heather! It reminds me of that movie with Jim Caviezel, "Frequency"... the voice over the radio, and friends singing with a dearly departed friend just one last time. Really quite haunting. groovyf, RAD ASSOCIATION! I had forgotten about that movie and now I have to go add it to my Netflix list to see it again. Thanks! I have an ex girlfriend that cheated on me with Jeff Buckley when he was in town. Hows that for a "relationship".